This is post 2 of 5 in the series Anthology of American Folk Music. In high school, I didn’t really connect with my United States history course. I halfheartedly attempted to “memorize the important identifications from the chapter(s),” as I was instructed to do by my teacher, but it was solely to achieve an acceptable grade. For whatever reason (“memorize the important identifications,” anyone?) I didn’t relate to history as a tapestry of stories about real human beings living through both ordinary and extraordinary circumstances. It was through music, starting with the Anthology of American Folk Music, that this would change. During the 1990s, the Byrds’ Sweetheart of the Rodeo album started me down a path tracing the roots of country music. The path seemed to end abruptly at a 1927 field recording session in Bristol, Tennessee that is frequently referred to as the “Big Bang of Country Music.” Soon-to-be-stars Jimmie Rodgers and the Carter Family , the “First Family of Country Music,” were discovered at the Bristol sessions. 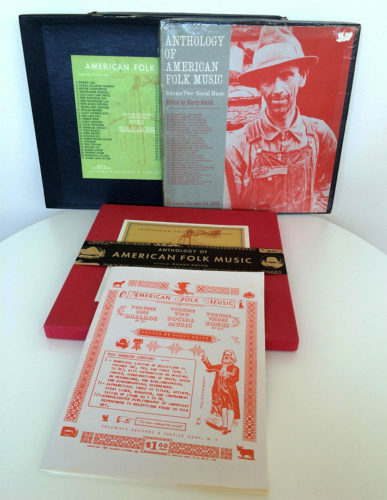 In the late 1990s, I also started listening to a set of CDs called Anthology of American Folk Music. The Anthology was a collection of American folk songs, some of which dated back to the English and Scottish ballads that were carried with emigrants to Colonial America. 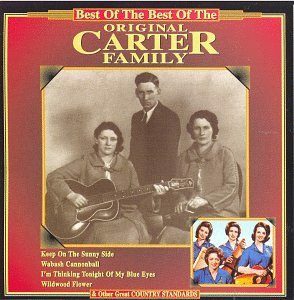 I had an epiphany that would forever change my worldview when I realized that the Anthology included four recordings by the Carter Family. The implication of this discovery was that the Bristol sessions were not the Big Bang of Country Music. The music of the Carter Family and other Bristol artists was connected to the music that came before it. While these artists in the 1920s recorded some songs of their time, many of the songs predated the recordings by 25, 50, 100, 200 or more years. All the music since the Carter Family, right up until today, is part of a continuum that reaches back to Colonial America and stretches across the Atlantic Ocean to the Old World. Whoa. Suddenly, listening to the music and digging into the essays and annotations that accompany the Anthology, the whole story of America came alive for me in a way that it hadn’t in my high school history course. It’s one thing to read about people and events from the past, but now I was hearing and feeling their words and music. The sounds are rooted in the traditions of the countries from which they came, but the music changed and grew as people from different cultures interacted in the United States. The lyrics reflect the hopes, fears, struggles, sorrows, triumphs, and humanity of the real people who lived our history. To follow the paths taken by the music is to understand the great cultural stew that is the United States. The entire story of America can be deeply felt and understood through the music of its people. The Anthology is organized in three volumes, with two discs dedicated to each. Volume One – Ballads, Volume Two – Social Music, and Volume Three – Songs. In subsequent posts I will explore each of the three volumes. The following Spotify playlist is a close approximation of Anthology of American Folk Music. The actual Anthology is not on Spotify. Most of the tracks on this playlist are the same recordings in the same order but from different sources. You should purchase the real deal on compact disc or record to get all the essays and annotations. The Carter Family and the “Big Bang” of Country Music? Browsing through the country music section of a music store in the late 1990s, I happened upon a CD by the Carter Family. Country music sections of music stores were new to me, and I was wholly unfamiliar with the Carter Family. As I was seeking new experiences in old country music (see my previous post How to Go from Rock to American Heritage Music), the photo on the cover of the album intrigued me. 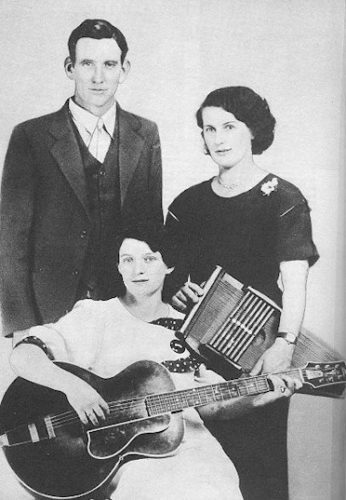 The text on the back of the CD referred to the Carter Family as the “First Family of Country Music.” There was also reference to them being discovered at a 1927 recording session in Bristol, Tennessee, that has been called the “Big Bang of Country Music.” The Bristol sessions were conducted by Ralph Peer of the Victor Talking Machine Company. He was seeking rural musicians to record for what was a growing “old-time” or “hillbilly” music market in the record industry during the 1920s. The Carter Family came from Poor Valley at the foot of Clinch Mountain in southwest Virginia. They were a trio consisting of Alvin Pleasant “A.P.” Carter, his wife Sara, and Sara’s cousin Maybelle. The first vocal group to become country music superstars, the Carter Family carried on in various forms with two generations of offspring, which included Maybelle’s daughter June, who eventually married Johnny Cash. Maybelle’s distinctive guitar style, playing melody notes interspersed with chords (“the Carter scratch”), was hugely influential and can still be heard today in many genres of music. So I had found the “First Family of Country Music” from the “Big Bang of Country Music.” At the time, it appeared that my search for the roots of country music, which began with the Byrds’ Sweetheart of the Rodeo, had reached its end. I had found the source. Or had I? I eagerly removed the shrink wrap, inserted the CD into the player, and hit the play button. From the opening guitar notes on the first track I was hooked. And when the three-part vocal harmonies kicked in on the chorus… just listen. Author Matthew SabatellaPosted on June 7, 2018 June 26, 2018 Categories Albums, Genre Overviews, Musicians, Personal, SongsTags Bristol Sessions, Carter Family, Jimmie RodgersLeave a comment on The Carter Family and the “Big Bang” of Country Music?